Columns - How does your garden grow? The reddening fruits of the Sichuan pepper. The English vernacular name ‘pepper’ can be confusing. Originally the Sanskrit name ‘pipala’ only referred to a spice the Romans called ‘Piper longum‘. Today, ‘pepper’ may indeed refer to true peppers of the pepper family (Piperaceae), to South American chili or chilli of the potato family (Capsicum, Solanaceae), to South American pink pepper of the mango family (Schinus molle, Anacardiaceae) and to Sichuan peppers of the orange family (Zanthoxylum, Rutaceae). They all provide ‘heat’ to your food, but their flavours are different. At the Dokmai Garden parking area we grow a Sichuan pepper tentatively called Zanthoxylum rhetsa (syn. Z. limonella), but the genus is unresolved and under revision. Many of the more than 200 species in the genus produce a hotness like other peppers, but also an ice-cold tingling sensation. Our species is like a very hot mint, and a long aftertaste and funny feeling of the tongue like when you try if a battery is still active but without the metallic taste. 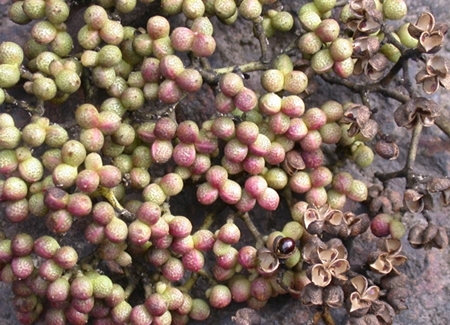 In the photo are the reddening fruits of our Sichuan pepper, with clearly visible aromatic glands seen as dots. We suggest you wait until these closed mini oranges open and expose their shiny black seeds (lower right). Remove these seeds, because they will tickle your teeth like sandy strawberries if you crush and eat them. What you have left are the empty and dry pericarps (husks). These are the source of the spice which you can buy at many Thai food markets. Thai names can be ‘phrik hom’ or here in the north ‘ma khwaen’. Some species of Zanthoxylum are native to the local forests. How do you prepare and eat them? Simply dry the husks and pound them with a mortar and a pestle or use a pepper grinder. Try the powder on pure rice first just to investigate its peculiar impact on your senses, then experiment as much as you wish!